From 1991, following a period of motorway construction, Hampshire County Council formally recognised that North Stoneham Park should be afforded greater merit as part of Hampshire's heritage and efforts be made to conserve, restore, and enhance the parkland as a viable historic and natural landscape. Following these surveys and consultations, this need was built into local and regional plans - seeking to: reduce further damage, bring portions of land into public ownership as a 'recreational and educational resource', and protect and reinstate surviving features such as the WW1 War Shrine. In 1996, a large portion of Avenue Park was acquired by the County Council and placed in public ownership for its preservation. A well-received landscape conservation and restoration project commenced in 1999. From 2005, the next stage focused on the restoration of the derelict Stoneham War Shrine memorial (b.1917), using this symbolic monument as a key to unlocking the history of the landscape. By focusing on the Shrine and its environs, the project sought to create a jewel-like landmark for Avenue Park, which it is hoped will galvanise support, and lead to a more ambitious project in the future - which might then include a complete survey of the parkland, a stewardship scheme, further preservation, and improved public access. 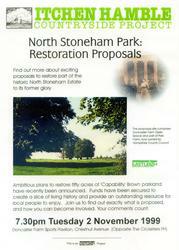 Copyright © 2012 Friends of North Stoneham Park. All rights reserved.